It’s always a delight when a Freedom of Information request hits the target. Last February, I wrote this post which listed the small army of personal advisers Mayor Lutfur Rahman had assembled at our expense. You’ll see there that one his hired hands until that point was a certain Gulam Robbani, who was also Lutfur’s agent in the Mayoral elections in October 2010. He is one of the mayor’s most trusted colleagues, so it was no surprise when Lutfur rewarded him with a consultancy role. In February, John Williams, Tower Hamlets council’s head of democratic services, detailed the nature of Robbani’s contract. As I blogged at the time, it was as “advisor on adult social care and health for one day per week at a cost of £40 per hour”. The following month, I wrote this post raising some strange discrepancies between the amounts Mr Williams said Robbani was entitled to and the amounts he was actually getting paid. I reported that between October 2011 and January 31 this year, he had been paid £13,080 under a renewed contract. I noted that this seemed to imply he was billing for far more than one day a week. I also noted that all this was being paid through Robbani’s company, G Social Care Ltd, which likely meant he was paying a lower rate of tax. Of course, Robbani’s role as a paid advisor ended at his own request from February 1 when it became clear that the long-running saga of Shelina Akhtar’s benefit fraud would provide him with the chance of replacing her as a councillor in Spitalfields, which he eventually did in April. I’ve just had the answer to a Freedom of Information request in which I asked the council for all the invoices submitted by G Social Care Ltd in 2011/12. The full disclosure is here. These invoices are staggering and I suspect they require some kind of investigation by an independent auditor. Parchment got this new post without any kind of formal recruitment, interview, shortlisting or assessment process. Although not due to start work until April 1, she is already in the office – and already demanding, according to council sources, to see people’s personnel files. In her City Hall days, Parchment was one of the eight top Ken Livingstone political appointees on vast salaries who proved so controversial (others included the disgraced Lee Jasper, and several members of the Trotskyite group Socialist Action.) Parchment lost her £126,000 City Hall job after Ken lost the 2008 election – but her pain was cushioned by sharing, with the others, a “severance payment” of £1.6 million. The Greater London Authority Act specifically stated that as a political appointee her employment was limited to the Mayor’s term of office, meaning that she should not have qualified for a payoff – but, as I documented in 2008, Ken quietly changed the rules not long before the election to ensure that Parchment and the others were looked after. With admirable chutzpah, she also managed to score a further £10,400 “consultancy fee” off the GLA after her departure. Understandably not short of money, she has spent the last couple of years quietly undertaking various Ken-related activities, such as appearing at his “Progressive London” conferences in 2009 and 2010. But now, thanks to Lutfur, Parchment has another lease of taxpayer-funded life. In summary, Robbani was billing himself out (with the express approval of his friend and fellow hired hand Murziline Parchment – something that does raise about question of financial control) at the rate of £360 a day. On each item, you will see he has billed for nine hours work between 10am and 8pm, although on a couple of occasions he invoiced longer hours for attending full council meetings. In October, he invoiced £1440, in November £3720, in December £1800, and in January, just as he was seeing the Shelina/Spitalfields opportunity arise, he put in his final and most lucrative invoice worth £6120. But it’s when we get into the detail that things get interesting, especially all his “meetings” with Cllr Adbul Asad, Lutfur’s cabinet member for health. In January, he billed for 17 of that month’s 18 working days (a bit more than the one day a week John Williams said he was entitled to – but maybe John got that wrong, I don’t know). In fact, when you cross-check all the claimed “meetings” with Cllr Asad on Robbani’s invoices, there are rarely any matches at all. 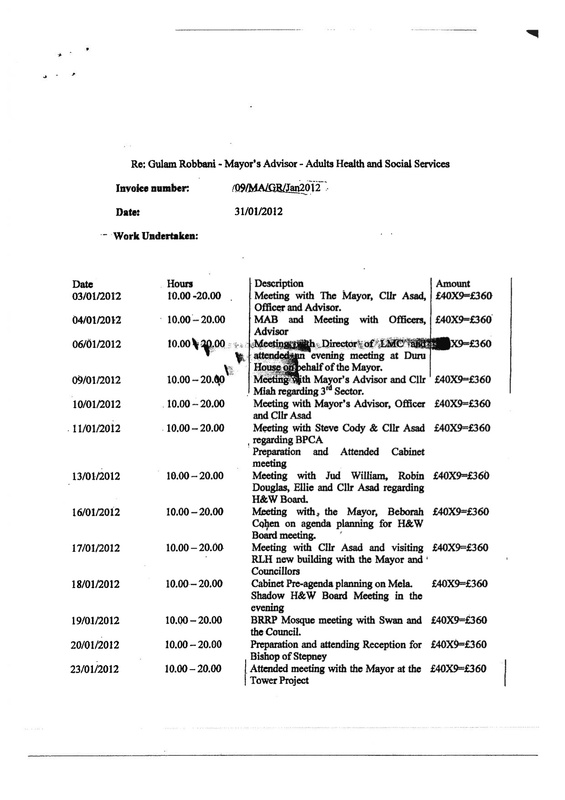 On Jan 27, Robbani bills us £240 for a “meeting with Cllr Asad” but there is no such meeting on Asad’s time-sheet. Perhaps Asad has been under-reporting his heavy workload. 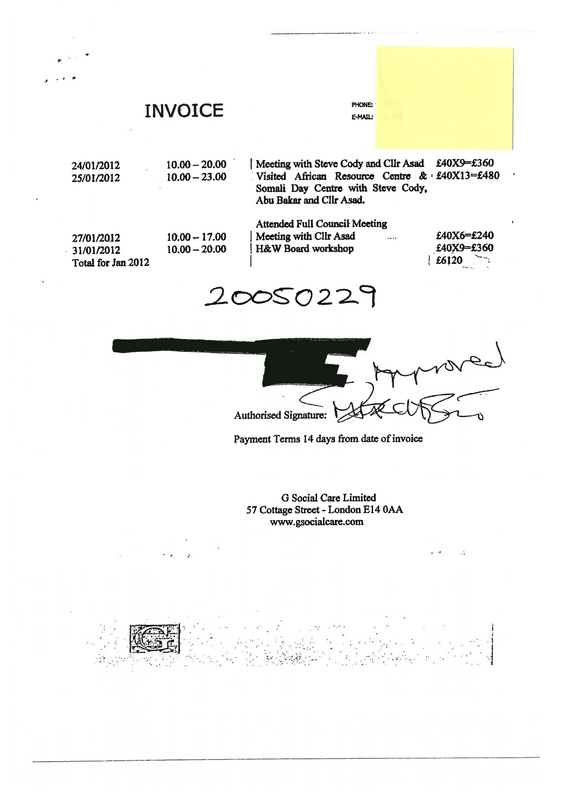 On January 31, Robbani was paid £360 for a “Health and Wellbeing workshop”, but on Asad’s time-sheet that appears to have lasted just one hour. Maybe Asad left early..
On January 25, Robbani billed £480 for working until 11pm visiting an African Resource Centre and the Mayfield House Somali Day Centre with Cllr Asad and two others. That took 12 hours’ work apparently. Well, Asad registered just 1.5 hours on his timesheet. Maybe Asad put the decimal point in the wrong place. On January 18, Robbani’s invoice claims £360 for “cabinet pre-agenda planning on Mela and Shadow Health and Wellbeing board meeting in the evening”. It must have been quite some pre-agenda Mela discussion because Asad tells us Shadow Health and Wellbeing board meeting took just two hours. And on January 19, Robbani billed £360 for a meeting about the “BRRP mosque with Swan Housing and the council”. Hmm. BRRP is the Blackwall Reach Regeneration Project which will demolish Robin Hood Gardens. That scheme includes provision for a new mosque to replace the existing Poplar Mosque, whose secretary is….Gulam Robbani. So, Robbani was billing the taxpayer £360 to attend a meeting (presumably on behalf of Lutfur, although how that fits in with his brief as a social care advisor beats me) with himself. Some might say that’s a win-win; others might suspect a conflict of interest. And that’s only part of January’s invoice. Similar questions arise when you look at the other months. 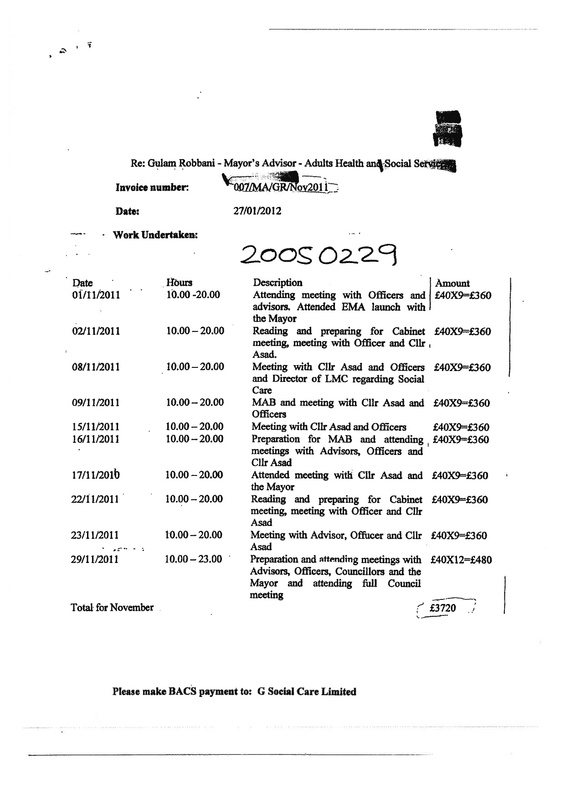 On December 13, for example, Parchment approved a payment of £360 for a meeting with Asad and the Mayor. But Asad has no record of this on his time-sheet. And have a look at this one from November’s invoice. 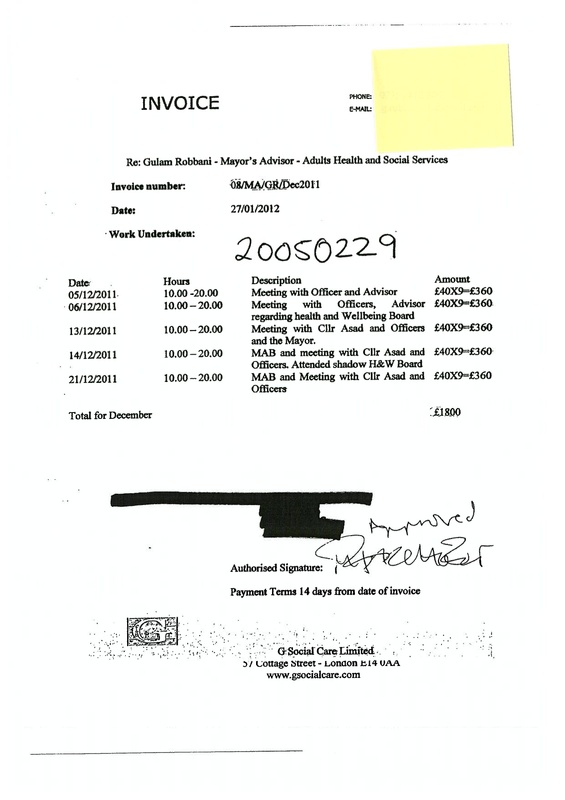 On Novemeber 2, Robbani claimed £360 for “reading and preparing for cabinet meeting, meeting with Officer and Cllr Asad”. Yes, there was a cabinet meeting that day. On the same invoice, Robbani claims another £360 on Novemeber 22 “reading and preparing for cabinet meeting, meeting with Officer and Cllr Asad”. No, there was no cabinet meeting that day. Did he simply copy and paste the January 2 entry by mistake? Did Murziline Parchment ask that before she signed it for payment? It appears not. At the very least it’s carelessness and incompetence. How many more payments are senior officers of the council signing off without checking. Did Chris Naylor’s finance team do any checking? Taxpayers deserve better. These invoices and Robbani’s contract need investigating. As a result of this post, at the full council meeting on September 19, Labour councillors succeeded in passing an emergency motion calling on the council’s anti-fraud team to investigate these invoices. Can this be a criminal matter? It should be. I suspect criminal intent is hard to prove though. If the work that has been invoiced for did not take place then that is prima facie evidence of intent to defraud. The fact that Parchment may not have checked the invoices is neither here nor there, if she was supposed to and didn’t she should be sacked. These sick thieves, should not call themselves Muslims. There are so many Old, sick and disabled people, who have had their services cut. While these sickos leech taxpayers money. IFE why don’t you defend your thief you got elected. We should all unite and crush these cockroaches. Very good post Ted. It is imperative that we scrutinise any function of the council and this example highlights exactly wht this should be the case. This is. It a witch-hunt. This is a FOI request which demonstrates how G Social Care AKA Cllr. Ghulam Robbani is ripping of taxpayers money at a time when we are faced with huge cuts in services including those of Adult Health and Social Care – the department supposedly responsible for looking after our elderly. Instead they are ripping them off with dubious amounts of money being claimed for turning up at meetings histing the Bishop of Stepney! And since when was the Mela an issue for this department? This lot should hand their heads in Shame, especially when they claim to be obidient to the treachings of Islam. This is simply a blatant abuse of power, and its not rocket science for any idiot to work that out? What does Cllr. Asad actually do if G Social Care is providing all the advice? How did this council function previously without such advisors at LAB (now MAB), Full council and cabinet meetings? We even get to watch Cllr. Shahed Ali now appearing on TV advertising Islamic Hajj Journeys. Wonder if he approves of these expenses as he does also seem to be sensible and outspoken, though not sure why he is still with Mayor Rahman? Other councillors that we elected need to raise this issue with their Mayor/Leader Lutfur Rahman. Afterall, they too have been elected by us and are equally accountable to us. Do they think these ridiculous amounts of money is value for money when the council is cutting services everywhere? Disgusting. on September 16, 2012 at 11:53 pm You couldn't make it up! 2) How were these outputs measured? 3) How was the value for money of this contract assessed – and by who? The hours billed are an absolute joke – ask any senior local government officer how many heavy duty meetings they have to get through in one day – plus all the preparation and reading! This man looks like a complete waste of time! One is forced to wonder how many other contracts like this are in existence? One might easily think this was simply a case of “jobs for the boys” – an impression reinforced by his subsequent election as a councillor. I wonder what Mr Pickles would have have to say? Or even the HM Revenue and Customs – they’re always interested in self-employed individuals who take a “flexible” approach to documenting their workload and what they were paid for it. I assume you’ve asked for the company records……..
Another excellent post Ted. Now start to look at council contracts that G Social care has had over the years and why they have lost them. I will phone Bangladesh later today for more information. You may have opened a can of worms for Lutfur here. Good bit of digging here Ted. Well done. In fairness, my suspicions are that this is a matter of poor process and incometence on behalf of LBTH. Checking consultants’ timesheets is a tedious process which is rarely done properly, and I suspect that Ms. Parchment feels that doing such menial work is a bit below her (massive) pay grade. If both she and Robbani are amongst the despicable Rahman’s cronies then there is probably a degree of mutual trust at play as well. She’s simply not doing her job well rather than actively intending to defraud. Robbani can’t be excused so lightly however. Those look like fraudulent claims (if what you say is true), and he is showing himself to be untrustworthy, at best. And one wonders why an untrustworthy character should be employed in this manner – indeed, why they can be given such a (trusted) position as councillor. How, as a local taxpayer, can we request that these matters are looked into by an independant auditor, as you suggest? Corruption, cronyism, theft, fraud… in another country maybe. Nothing to see here. Walk on by. Looking through LBTH website and to no surprise, this bent councillor Robbani has not filled his timesheets since becoming elected to public office, probably because he was too busy filling his timesheets to claims the thousands he has ripped off, courtesy of Mayor Rahman. No doubt his timesheets now will be carefully orchestrated to tally up to avoid other truths unveiling themselves. As the consultant he was, surely he should know better that good practice is demonstrated by filling timesheets when in public office? 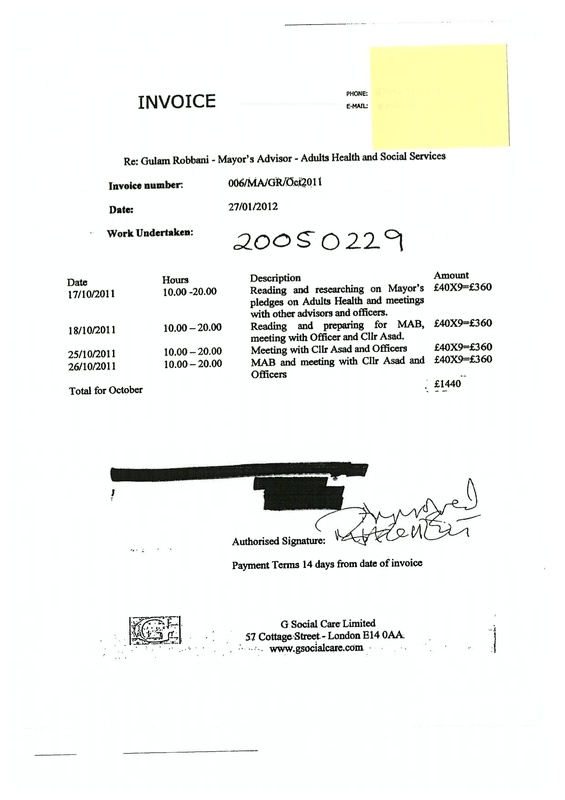 What qualities or demonstrable track record awarded G Social Care these contracts from Mayor Rahman? Have thry ever been commissioned to do any other work by any other local authority. I doubt it? Finally, does the ‘G’ in G Social Care mean ‘Ghulam Social Care’? Bet the elderly having their services cut will appreciate he also needs taking care of! on September 17, 2012 at 11:30 am You couldn't make it up! Let’s be clear here – professional consultants who have the expertise, integrity and standards to merit that title NEVER ever fill in time sheets for a client. The reason being that to merit the term ‘consultant’ they must be able to make wholly independent decisions as to how they fulfil their assignment. The term “consultant” has been appropriated by people who wouldn’t know a professional standard if they fell over one to describe their status as a temporary employee. It is usually intentionally used to obscure the fact that they are being employed as temps. It’s very often used by those who are all about the surface bling and have very little to offer in terms of expertise and substance. Temporary employees should always be taxed at source and required to pay NI – just as employers are required to pay employers NI. Failure to do so renders the organisation which pays them liable as well as the employee for any unpaid tax and NI. Furthermore, if there is a suggestion that the employing organisation treated remuneration in this way to avoid the payment of employers NI then there are some very stiff financial penalties to pay to Hm Customs and Excise. Plus those who advise that this is an appropriate way of paying people who are not proper consultants render themselves open to disciplinary investigation on the basis of negligence. The use of companies to try and circumvent how people are employed and paid has been the subject of a lot of investigations by HM Revenue and Customs who have very clear views as to which individuals and companies can enjoy this type of approach to remuneration. I note they’ve been tightening up more and more on the tax evasion which is very often associated with such companies – as well they should! By way of contrast, very many political parties and administrations use interns who do not get paid and do their work for free on the basis that it offers them a way of enhancing their career prospects in the long run. They also come and go with the administration and do not hold any sort of full-time post. If they are ever paid it is through party funds and never from government budgets. Maybe Tower Hamlets would like to explore the scope to use Interns in the place of people who appear to be ripping off taxpayers’ money! Excellent work Ted. It is sad that hard working families have to pay for this nonsense and they get so little (or nothing) in return. What can citizens do? Can we pay for our own bins to be collected (or drive them to the dump ourselves) and just opt out? What is it about Tower Hamlets which makes it so prone to corruption, electoral fraud and shambolic governance? I’d love to be able to take my own rubbish to the dump, or pay per collection. And not pay council tax. £1700/year comes to around £32 each time my bin is emptied, as that is just about the only service the council offers me. And that’s before we count the cost of parking, or the central government subsidy. But this is aside from the problems of LBTH; it’s the same anywhere in the UK. Makes you wonder, doesn’t it? Is it relevant that the council is so closely linked with Bangladesh, and that country seems to suffer from exactly the same malaise as LBTH? Is it possible to see the actual reports he made or evidence of work he submitted during his consultancy? Can this be achieved through a FOI? on September 17, 2012 at 6:57 pm You couldn't make it up! In principle it should be. The list of exclusions are actually quite narrow. Tower Hamlets wasn’t very good at FOI at the beginning – it’s getting better at responding appropriately. Presumably IF Robanni is proved to have made false claims then that would be fraud and a criminal offence and were he convicted and then gaoled (for three months or more) we would then have yet ANOTHER by-election in Spitalfields which would be hysterical…. I cannot wait. They should just declare this borough ungovernable and leave the people within it to fend for themselves. It’s about time that you allowed the post about the two Lutfur Independents who live in Ilford to be put up. It is simply a matter of fact and nobody is going to sue you. Robbani was elected by a 43 vote majority in a massively corrupt election with dozens of people registered in flats they didn’t occupy. His supporter Shelina Ahktar was sent to prison for renting out the council flat that Lutfur arranged for her to jump the queue to get ahead of people who really needed it and now two of his closest supporters are living, as did a former Lutfurite for Weavers Ward who had to resign. I recall an excellent article you did in the Advertiser where you doorstepped ” The member for Ilford”, the time is long overdue for a few more resignations and by elections provided they are properly scrutinised. Let me know if you want the addresses. Where does Lutfur Rahman live? I’ve been told by at least four councillors that “nobody knows” and the presumption is he lives outside the borough. Is his address published somewhere for electoral purposes… perhaps someone can go and knock on that door and see what answers it? The Mosque and Community Centre has moved from the very small blue building it once occupied to the former construction training centre near Blackwall Station. Is it possible to find out who owns this building ( I suspect it is owned by LBTH), who paid to refurbish the building from a training centre for local kids to its current use and how much rent is being paid etc. I have seen FOI requests for information about who is paying for the new building and land for “the second biggest purpose built mosque in Tower Hamlets” taking into account the power that its sectary seems to have had within Tower Hamlets Council. This is an issue of fairness for me and I feel that Tower Hamlets and Swan, administrators of public money need to be transparent and not hid behind the “commercially sensitive information” clause of the Freedom of Information Act. The mosque has been moved to the old LLIC (local labour in construction) building while work goes on to build the new mosque at the old site. The community demanded some benefit to the them for swan breaking the old houses and building new ones. Swan agreed to build a new mosque for the community of my area and asked us to contribute 300k towards it. So in theory, nothing wrong with building this mosque, its what the majority of my local community wanted. If you are being asked to contribute 300k, can you provide the overall cost of this building which in all fairness will serve one section of one community in the area. Are the local community the small number of men in the private meetings held late last year? Then one needs to confirm if Swan is using money drawn down from goverment grants (tax payers money). if so, could this money be better used to improve education or health for all the people in the area? Can you tell us what role Gulam Robbani played in this deal? I don’t follow- a private meeting to thank them for political support sounds reasonable. But you say he had council officers with him? Sounds like some of it was council business, some of it was political. That’s not exactly suspicious as it stands. I agree about the “commercially sensitive” thing though. is he worse than anyone else for trying to hide behind that? Mr Robbani also claimed 18 hours at £40-an-hour for two meetings last October with Cllr Abdul Assad—yet Cllr Assad’s timesheets registered a total of just three-and-a-half hours, according to Cllr Golds’ motion. Robbani had to do work in advance of the meeting too- prepare papers etc. Assad just attended the meeting? Why should the timesheets match? Tubby Isaacs is obviously one of the clowns from the Mayor’s Office trying to justify something that is not justifiable. Robbani siphoned money, its simple as that. He saw a good opportunity, a weak leader and an incompetent Head of Mayor’s Office who clearly signs off money without any diligence, would she have done that if that was her own money? Is Robbani really worth £6k a month? Does he really need so many hours of prep work to meet a clueless Cllr Asad (who can’t even spell the word ‘councillor’), its worth seeing the extra ordinary paper work that Robbani had to prepare before meeting the mighty Cllr Asad. 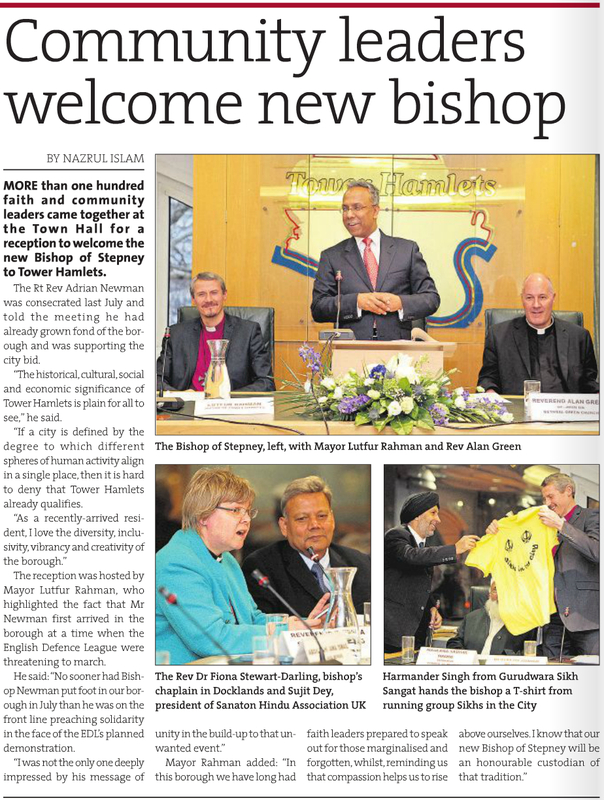 Mayor Lutfur and his bunch are just a laughing-stock! You can’t even take them seriously. Even the former thug and gangster Alibor is now wearing a suit and pretending to look smart, what next? This is all comical. Mayor Lutfur and his bunch are just a laughing stock! You can’t even take them seriously. Even the former thug and gangster Alibor is now wearing a suit and pretending to look smart, what next? This is all comical. The Electoral Commission’s code of conduct on postal votes says that party activists “should not touch or handle anyone else’s ballot paper” and “it is absolutely clear that anyone acting on behalf of a party should not solicit the collection of any ballot paper”.Mr Rahman’s councillors, Aminur Khan, holding a sheaf of papers which the resident said were ballot papers. Mr Khan categorically denied last night that he had been involved in collecting any ballot papers. The byelection, caused when one of Mr Rahman’s councillors was jailed for housing benefit fraud, was narrowly won by Mr Rahman’s candidate, Gulam Robbani. Another election gift going a little wrong? Why would any of these timesheets match? One seems to be just attending the meetings, the other preparing and attending them. I used to have basically a full-time job preparing for meetings. The meetings lasted only 2-3 hours. So was my timesheet false when it showed me spending much longer on them. I’m not happy with the powers that elected mayors have just to appoint favourites, but it’s true of others, not just Rahman and Livingstone. But I suppose it’s only “cronyism” when it’s done by people you don’t like. “tubby isaacs” would appear to be the trotting out, belatedly, of what is presumably going to be robbani’s defence, although it took a while to yet there! He’s bust and he knows it though. The question is who goes down with him! Tubby Isaacs should stick to selling his past its sell by date sea food down at Aldgate. Mind you with some of the apologising he does for Lutfur he is probably Stuart Madewell. That’s not fair, I like his food. Actually ‘Tubby Isaacs’ name is being misused, the person writing this garbage is the Mayor’s pet ‘Shazid Miah’. You will see him all the time with the Mayor, he is an IFE member, acts as the mayor’s bodyguard and PA. Mayor Lutfur appointed him as his political advisor, someone who has no political experience; I think we can say that for a lot of them in that group.